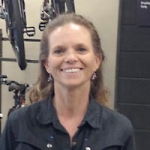 Hello my name is Michelle Bushoven and welcome to ABC Bicycles. I am originally from Gainesville and moved to St Petersburg 10 years ago. I am very proud mom of 2 great kids. I have not always ridden a bike. I grew up in riding horses and competing 4-H horse shows and High School Rodeo (Oh yes! A cowgirl.) However I have always had a desire to help people grow and achieve their goals. So, when Rick asked me to join the ABC Bicycles team part-time on Saturday, I excitedly said yes. Little did I know that Saturday would just not be enough? I would head to work on Monday and have to stop in on the way home each day just to say "hi". Between you and me, I think Rick hired me full time so that I would just go home. I am excited to say that yes I did become a full-time team member in May 2011. Never looking back only forward! I have grown from a nervous cyclist to a confident person both on my bike and in my personal life. Being a part of ABC Bicycles has allowed me to bring my life full circle…I was meant to be here. Each day is new and I believe we have the opportunity to make a difference. Every day at ABC is like that first ride on your bicycle, we are all so nervous but yet so excited. Riding a bicycle has allowed to me to become stronger, more confident both for my family and for you my ABC family.I love riding my bike and sharing experiences with new riders, customers and friends. I have discovered that we can see and dream anything on out bikes. I have enjoyed triathlons, bike ride and even more importantly riding for local charities such as Cure On Wheels and the YMCA Livestrong Foundation. I am living proof that you can do anything you set your mind to and the only limits you have are the ones you create for yourself. It does not matter how young or how old, just go out and have fun and believe! There is magic inside these doors, come inside I will see you there.